Listrak, an independently-owned digital marketing platform, has predicted seven key trends set to impact the North American consumer market, retailers and brands this holiday season. High Revenue Impact: Overall, email has a high impact on holiday revenue. Sending as many as four additional emails per month provides a huge revenue boost, marking a return of $59.26 for every dollar spent. Give Thanks for Dark Stores: Many retailers, including Costco, H&M, Ikea, Marshalls and HomeGoods have touted their remaining closed or operating on limited hours Thanksgiving Day, with some also remaining closed on Black Friday. Dark stores may mean increased site traffic, so capture it by sending multiple emails on those days. After Dinner Deployment: Adding an evening email to the deployment schedule will take advantage of site traffic spikes after dinner. 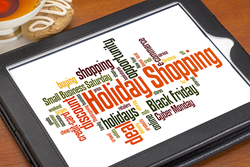 All Day Long: Sending multiple emails at various times on Black Friday will engage shoppers who shop all day long. Monday, Cyber Monday: Email volume drives site traffic on Cyber Monday. Listrak noted a 42.4% increase over 2015 volumes, and recommends deploying two or even three emails on Cyber Monday as shoppers are looking for deals throughout the day. We’re Here All Week: Keep campaigns rolling throughout Cyber Weekend, but don’t ignore the following week. Shoppers welcome emails this time of year, and as many as 27% start buying the first two weeks of December. For more information, visit our Holiday Insights Center or download our holiday infographic. Listrak’s customer-centric data approach helps digital marketers cultivate deeper relationships with consumers through personalized, multichannel strategies that drive revenue, engagement and growth. Listrak helps reach those customers at the right time and the right place, regardless of the source, channel or device. Listrak has decades of digital marketing knowledge and works with leading brands. For more information, visit http://www.listrak.com.